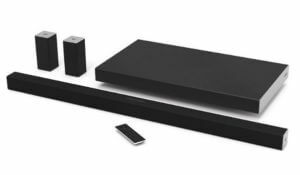 The new lineup of SmartCast sound bars released by Vizio has received a lot of attention in the home theater world. The 5.1 channel home theatre system, SmartCast SB4551-D5 comes with 47″ sleek sound bar, paired up with a slip-profile subwoofer in order to deliver surround sound. Setting up a personal home theater can be considered as one of the best methods available for modern world individuals to bring unlimited entertainment to their homes, and this system is built to offer a great surround sound experience. Read Vizio SB4551-D5 review to explore how this latest product stands out in competition. The most trusted Vizio brand has made sure the latest SB4551-D5 is power packed with high-end hardware and useful features that every HT geeks look for. The centerpiece of VIZIO SmartCast™ 5.1 Sound Bar System is a thin profile 45-inch sound bar. You can mount it on a shelf or the wall without any hassle because of the sleek design. In other words, you are provided with the freedom to figure out the perfect way to mount, so that you can match with your television. The system comes with 4-inch speakers on right, left and center speaker bars, with 104 dB sound output. 8-inch speaker inside the sleek sub offers bass as deep as 30 Hz. 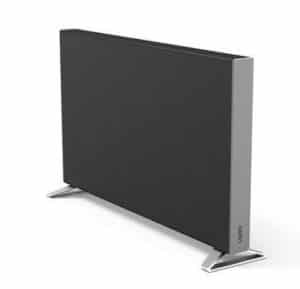 This sound bar has the ability to offer both DTS and Dolby Digital decoding. Built-in Bluetooth is another impressive feature that can be found in the system. It would assist you to connect the sound bar system to Bluetooth enabled devices in your home such as smartphones and laptops to play music directly. VIZIO SmartCast™ SB4551-D5 Sound Bar System can be connected to the Internet via two different methods. Either you can use the Wi-Fi connection at your home or use an Ethernet cable. Connecting this system to the Internet can open up a variety of new opportunities. It is a multi-room enabled system that is compatible with Google Cast. As a result, you will be able to gain access to thousands of audio content on the Internet. A variety of physical audio connectivity options are also provided to the users of VIZIO SB4551-D5 Sound Bar System. They include Analog Stereo, Digital Optical and Digital Coaxial audio connections. You can also find input HDMI port on this system. As mentioned earlier, the wireless and slim profile subwoofer that is provided with this system can be mounted vertically or horizontally. The subwoofer has a width of only three inches. Therefore, you will not have to go through any hassle when mounting it. You will easily be able to place it anywhere to give life to excellent low frequency effects. The two surround sound speakers that are provided along with the VIZIO SB4551-D5 needs to be connected to the subwoofer physically. The subwoofer would receive audio signals wirelessly through the sound bar, but it would transfer them to the speakers through wires. Therefore, it can also be considered as a semi-wireless audio system. A wireless remote is provided along with the package, but you can simply convert your smartphone into an advanced remote controller by downloading the SmartCast App from iTunes or Google Play Store. You will never be able to find such impressive functionalities from any other audio system available in the market at this price tag.